Simple food is always so satisfying, isn’t it!! And today I was craving freshness. A meal that is both light and satisfying, a fulfilling salad for lunch. I went shopping this last Saturday, looking for some gluten-free pasta. I have gone completely gluten-free about six months ago and feeling great as a result, but I haven’t eaten any pasta since. I have missed it, so I was keen to try some. I came across 3 Grain Penne by Olive Green Organics at Thomas Dux, made up of brown rice, quinoa and amaranth, tasted delicious . It was also so easy to cook, light and flavoursome. For a dressing I wanted something with a nutty flavour, sesame flavour will do just fine, I thought! The result was exactly what I had in mind, it was indeed a satisfying and a refreshing salad that is full of flavour. Hope you get to try it and enjoy it too. Boil pasta according to instructions on packet, drain , rinse under running cold water and set aside. 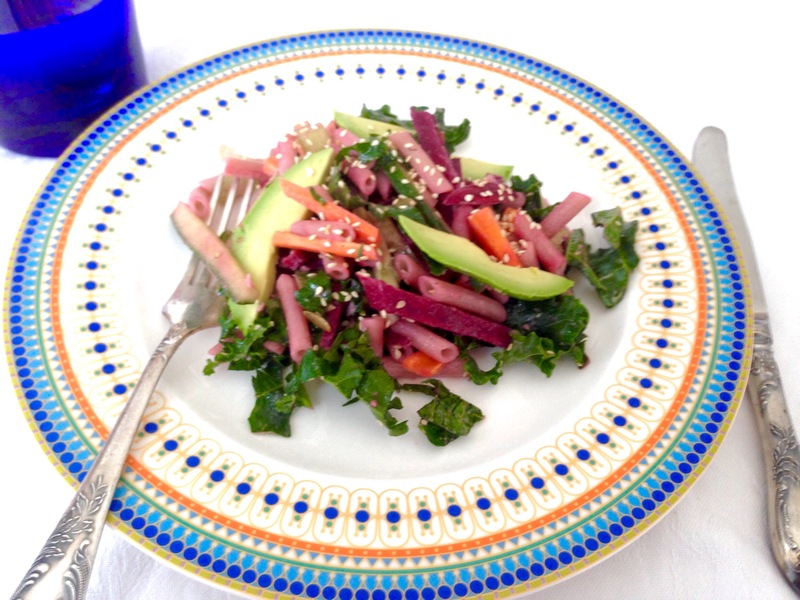 Chop kale thinly, and cut carrots, beetroot and cucumber into julienne thin slices. Chop celery, shallots and parsley. Slice avocados. Place sesame seeds in a small pan and roast for a couple of minutes on the stove, stirring constantly until they change to a golden colour. 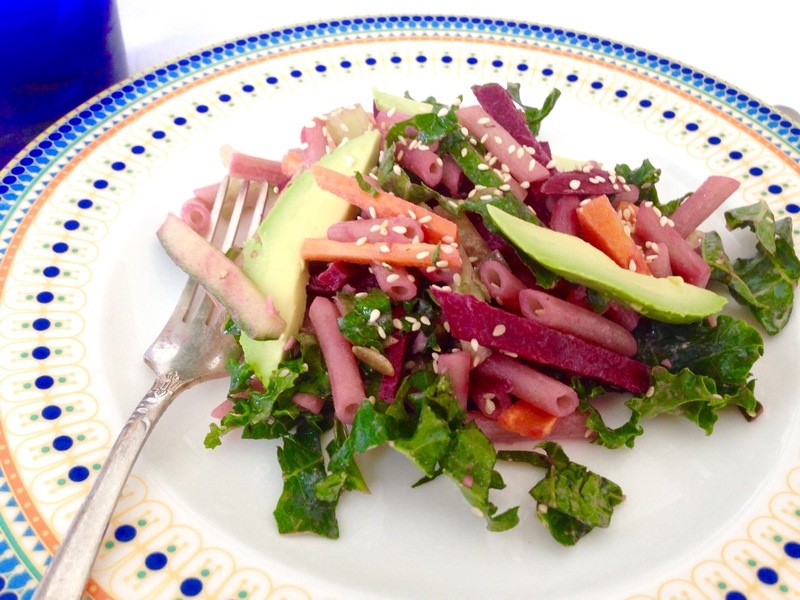 Place penne, and rest of vegetables,papitas and half the roasted sesame seeds except avocados in a salad bowl and mix together. Make the dressing by crushing the sesame seeds with a pestle and mortar, add sesame oil, vinegar and mix together, add mayonnaise and mix well. You can add a tiny bit of cold water if dressing is too thick, but be careful not to make it too runny. When ready to serve, add dressing to salad, mix all together. Add sea salt to taste, then add avocado slices and sprinkle rest of sesame seeds on top and serve. Tags: beetroot, dairyfree, food, glutenfree, healthy, kale, pasta, recipes, salads, vegan, vegetarian. Bookmark the permalink.